Avant-garde forms often utilize open concepts in order to invite the viewer into the structure. 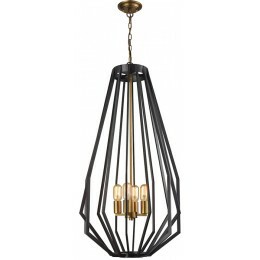 More like a permanent sculptural aria than a simple chandelier, the Fluxx features a chic cluster of aged brass-finished lights embellished by a boldly arrayed geometric openwork that suggests a constant state of dynamic motion. Stylish Oiled bronze color story. Instantly the star of any room.